Looking for holiday gift ideas for the runner in your life? 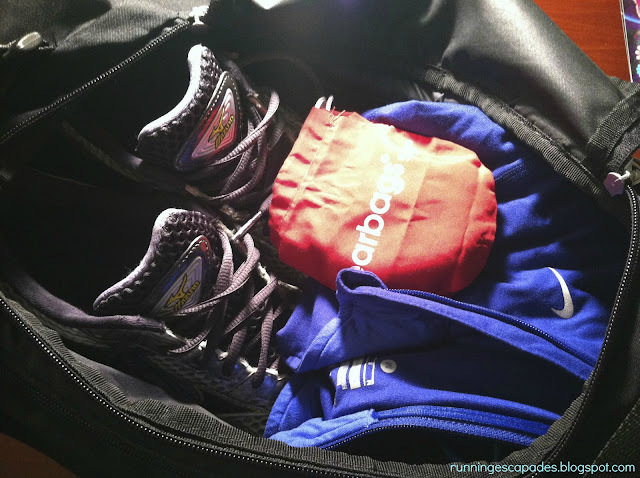 I thought I'd put together a simple list of runner items that won't require you to know a lot of details (brand, size, color) and that won't cause you to worry about whether your runner already has one. 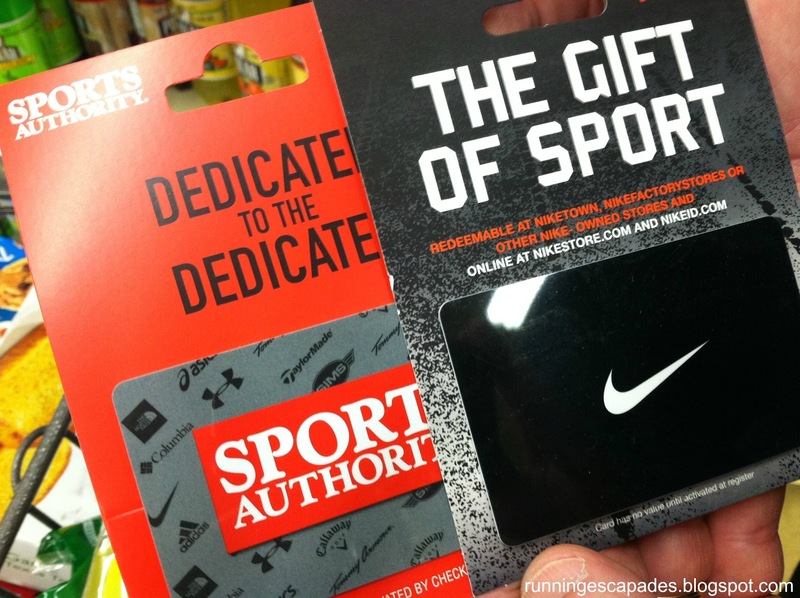 Gift Cards - Runners love to shop for new gear. A gift card to the local running store or sporting goods store is great, but there are also awesome online stores for runners, such as Road Runner Sports, and Running Warehouse. There are also specialty stores that runners generally like to shop online such as Lululemon, Oiselle, and Athleta. 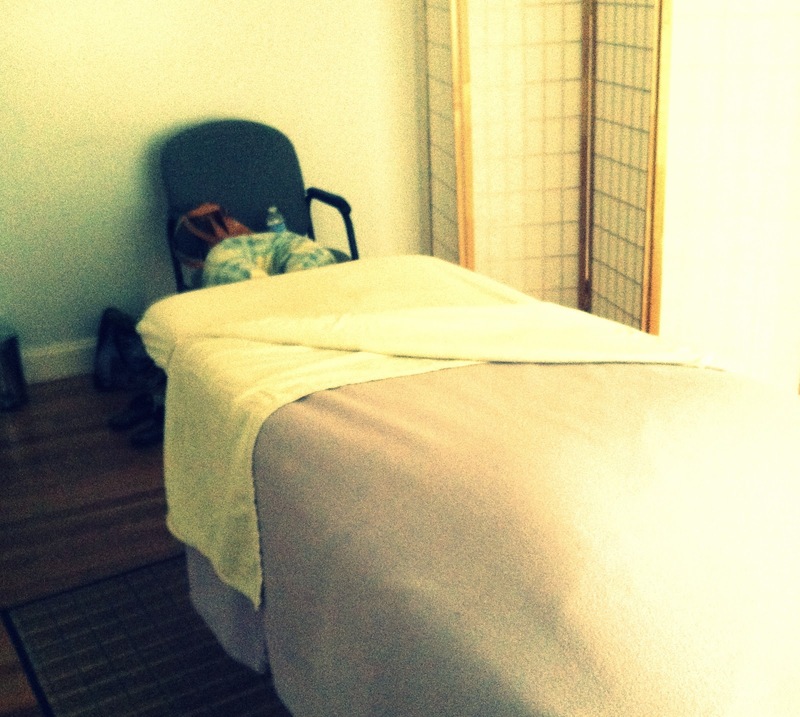 Massage and Spa Visits - Reward your runner for all their training efforts with an hour long massage at her/his favorite masseuse, or treat your runner to a manicure/pedicure at the local spa. Bling - Bling isn't just about the big medals at the end of the race anymore. 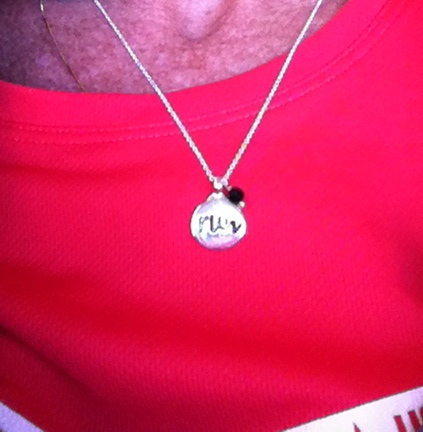 Surprise your runner with a pretty necklace or bracelet. You can find some nice selections at Erica Sara Designs, Sporty Girl Jewelry, and some non-traditional safety bling at Road ID. Books - If your runner is also a reader, think about running books. There are books on running, runners, runner's diets, runner's form, running history, and more. 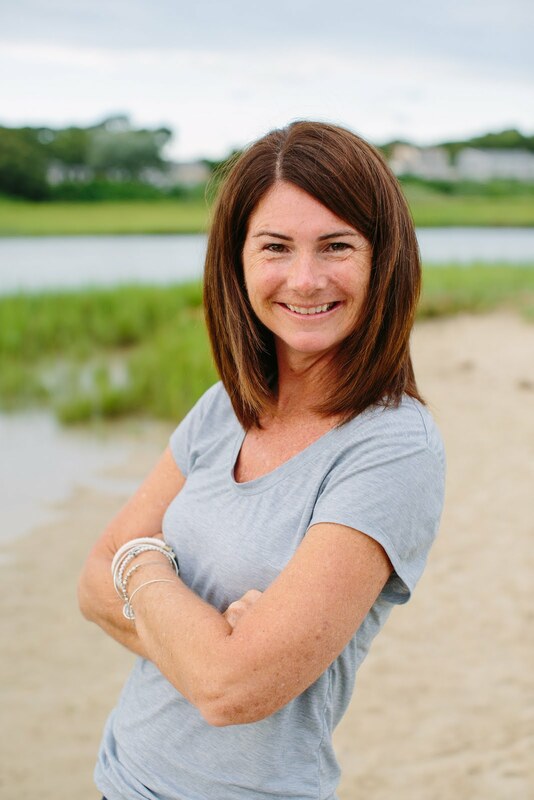 Some popular titles include Born to Run, Mile Markers, Going Long, Sole Sisters, The Runner's Guide to the Meaning of Life, and Train Like a Mother. You pretty much can't go wrong here. 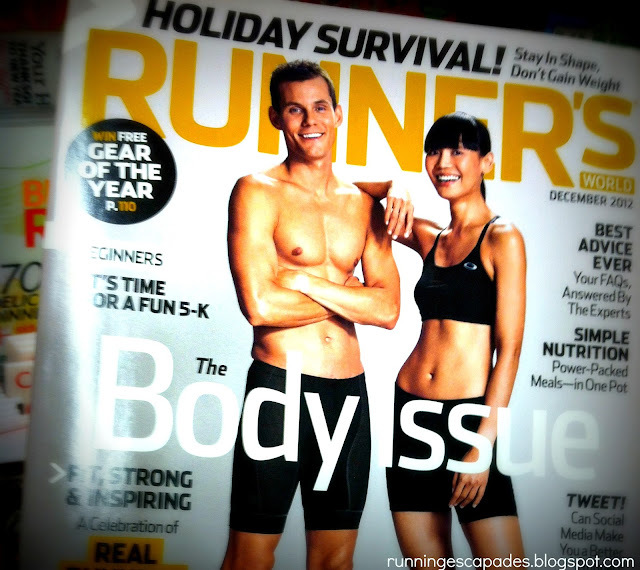 Magazines - Buy a subscription to one (or more) of the popular running magazines so your runner can stay up to date with current trends in gear, get training tips, and read advice from experts. Consider Runner's World and Women's Running. 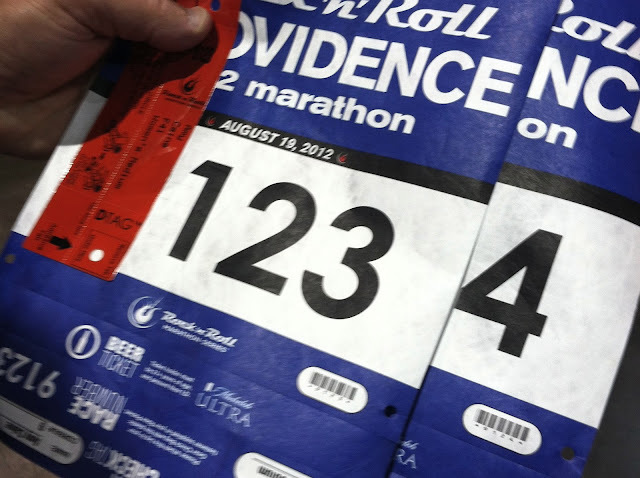 Race Registration - If you know your runner is planning to sign up for a race, gift her/him the registration. Better yet, sign yourself up too and join the fun. You might also consider planning a destination race. 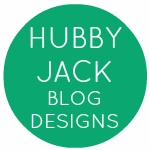 I pinned some great ideas here. Just be sure that you are both ready to take on the distance. You can search for races on Active and Cool Running. Stocking Stuffer Ideas - Some smaller items that would make great gifts or fit in a stocking include running fuel, like GU, Sport Beans, or small bottles of Gatorade, all of which you can easily get at your local running/sporting goods store. All runners need a good water bottle and Simple Hydration is awesome. There are also cute car magnets for runners and you can never have too many socks. 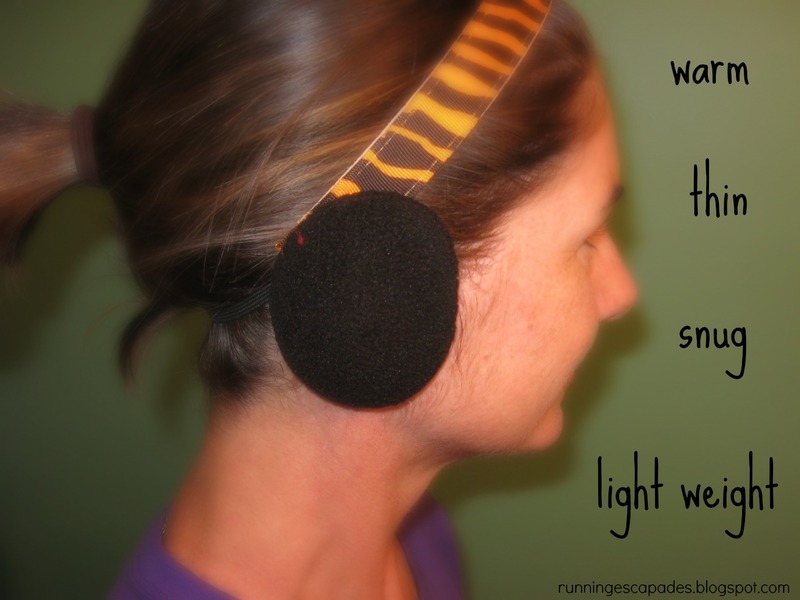 And for your female runner, you can't go wrong with a wrist wallet or some Sweaty Bands. Running Shoes - Unless you know exactly what pair, color, and size because your favorite runner has been dropping hints left and right, I would avoid picking out a pair of running shoes. Runners are very picky and want to know what's in this kind of box. So there you go. A simple runner-friendly gift guide to get you through the holiday season. And remember, it's ok to ask your runner if there is anything she/he is hoping to find gift wrapped this year! Don't want to wait for the perfect gift that will keep your ears warm? Enter my Sprigs Earbags Giveaway before it's too late! And don't forget, if you place an order, you can use my coupon code Escapades20 for 10% off of orders up to $29.99 or 20% off orders over $30. It expires 12/12/12 at 11:59 PM EST. Saturday's weather reminded me that winter is right around the corner and I need to protect my ears from the cold and wind. Just because Mother Nature hasn't dumped a bunch of snow on us yet, doesn't mean it isn't biting cold out there. 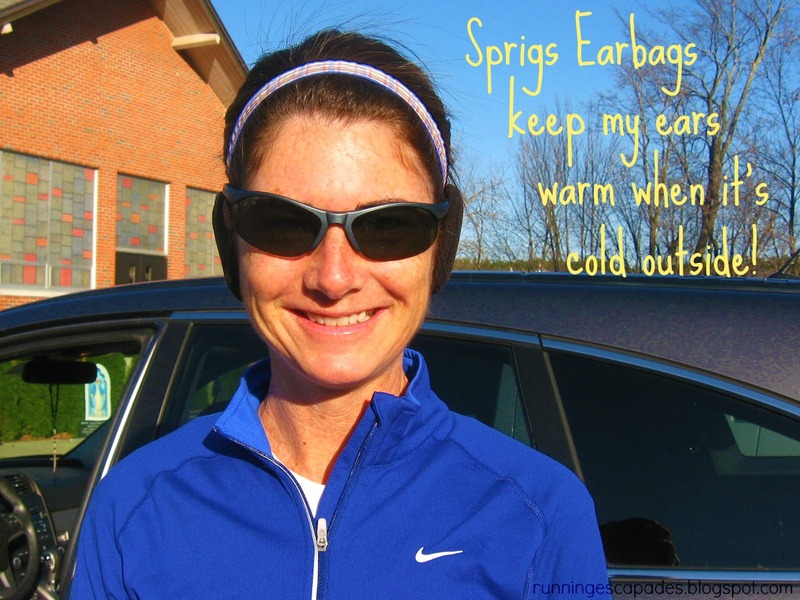 So this morning as I packed my running bag with my favorite Nike running capris and a warm pullover, I also made sure to include my Sprigs Earbags. I have been using them ever since receiving them to review. The afternoon temperatures hovered near 40 degrees, but with the added winds and lack of sunshine, it was chchchchilly! The run was cold. You can see me hiding my hands in the picture. During the run my lower legs were cold (I should've worn long pants instead of capris), but my Earbags kept my ears nice and warm. Now YOU can win a pair of your very own. Sprigs has generously offered three winners a pair of Earbags of his/her choice. Holiday weeks can make it challenging to maintain a normal running schedule. 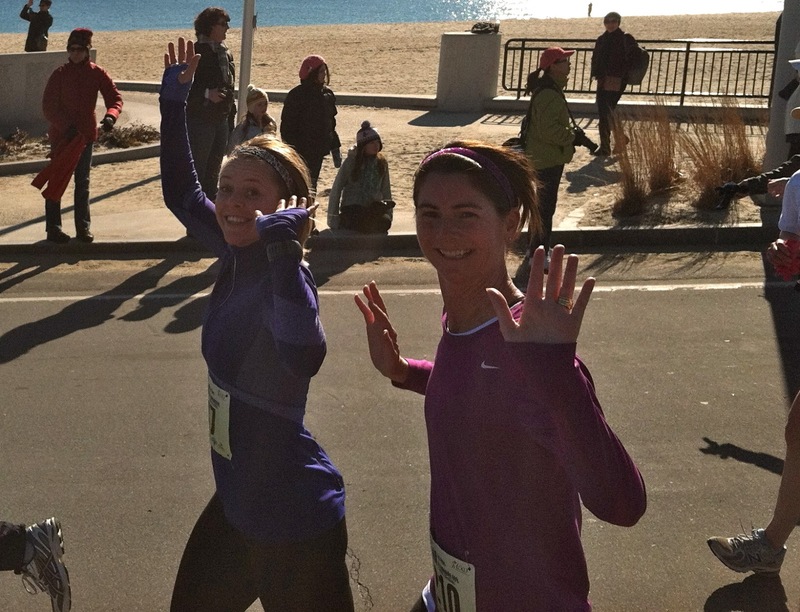 In the past, I have participated in a Thanksgiving Day Race which means no interruption, but this year we traveled to the in-laws in Massachusetts. 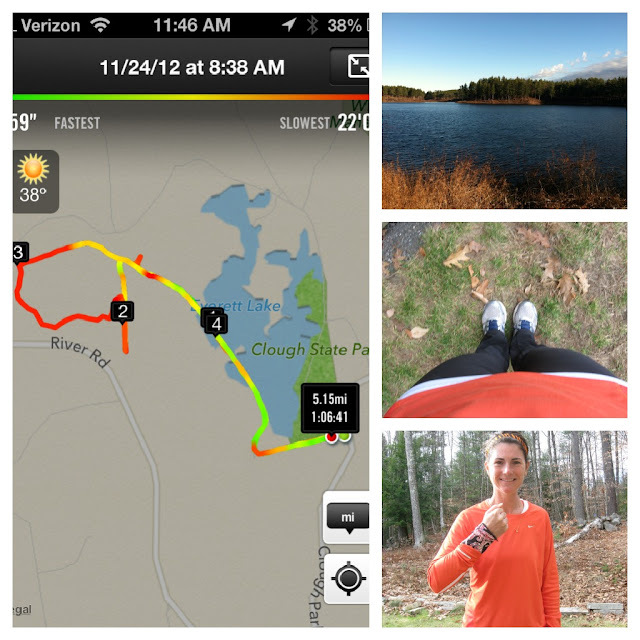 I was able to score a couple of five mile runs and we enjoyed a fun lunch stop on the way back to NH on Friday. #TrainingTruth: Running is a good way to de-stress before the holiday. I look forward to holiday breaks, but the days leading up to them can be stressful. 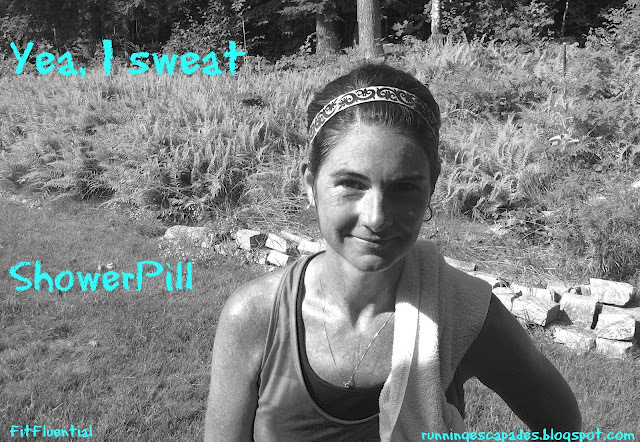 Tuesday's run was extremely helpful in allowing me to dump some of the negativity both physically and emotionally. High Five to Daisy for always being a great listener! #TrainingTruth: Sometimes a missed opportunity to run is an opportunity for a family adventure. After spending Thanksgiving in MA, my sister-in-law told us about a great place to eat that happened to be on our way back to NH, so we stopped for lunch. The girls, my husband, and I had a wonderful meal sitting by an open fire before taking a few laps through the candle, holiday, and chocolate stores. 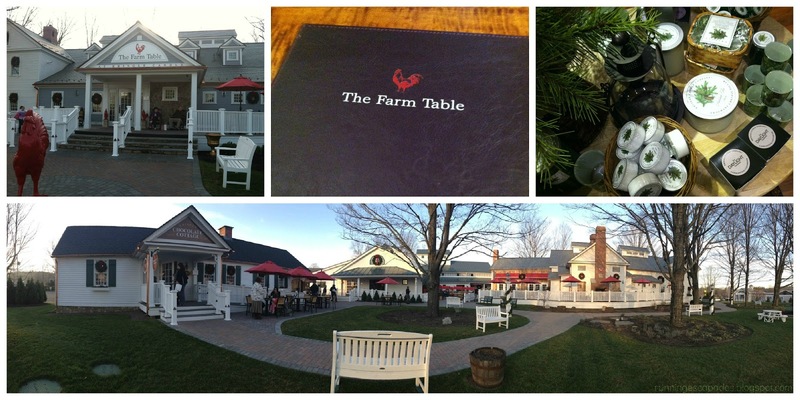 The Farm Table is very popular (reservations are usually required, but we lucked out by arriving just after a cancellation was made) and offers gluten-free options on the menu. High Five to my step-daughter for her panoramic photo-taking ability. #TrainingTruth: Best way to forget being cold...get lost on a trail run. Bitter cold winds greeted us on this second attempt at running the trails inside a local state park. About 2 miles in and we were already trying to figure out where we missed a turn. Since I was carrying my phone in my Big Banjees wrist wallet, we were able to almost figure out the trail. High Five to Daisy for picking herself up and dusting herself off after taking a dive on the trail. What were your High Fives? I have seen ShowerPill Athletic Body Wipes popping up all over the place. 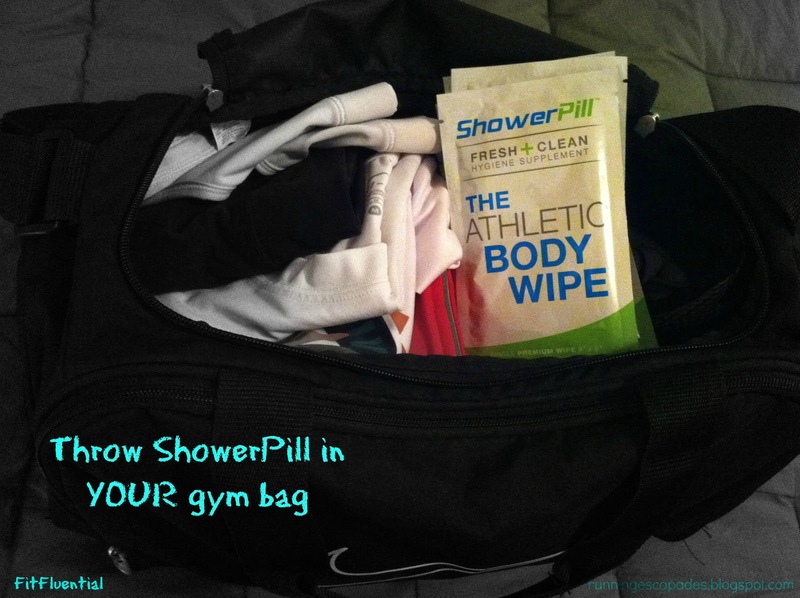 Since I consider myself someone who sweats a lot, I'm always on the lookout for products that I can use after a workout when I don't have a chance to shower right away. Like when you exercise after work and still have errands to do. Or after a race, when you want to hang out with friends and maybe go out to eat. Needless to say, I was pretty excited to get the chance to try them out for myself. 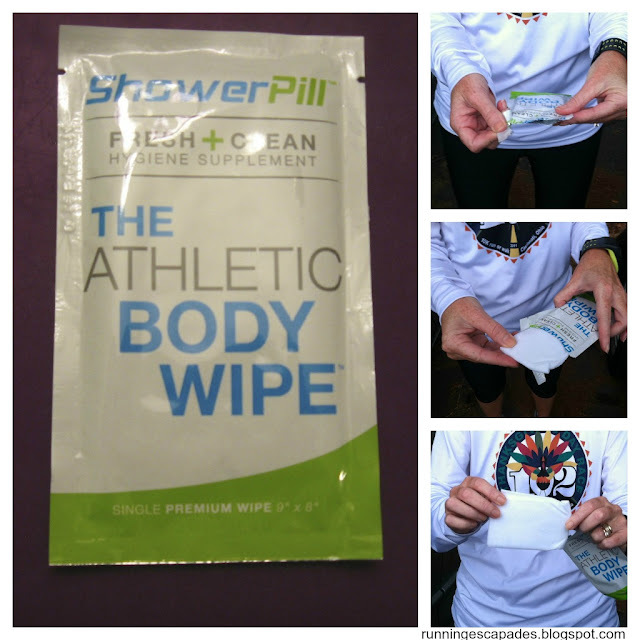 A couple of college athletes who were always busy, busy, busy and had very little time to squeeze in a shower after working out decided to create an instant hygiene supplement after one of them was exposed to bacterial meningitis. The name is a reference to how they jokingly wished there was a quick little pill to take to become instantly clean. Each wipe is individually packaged making it simple to carry in a gym bag. The package is easy to open and can conveniently store the used wipe until you can throw it away. 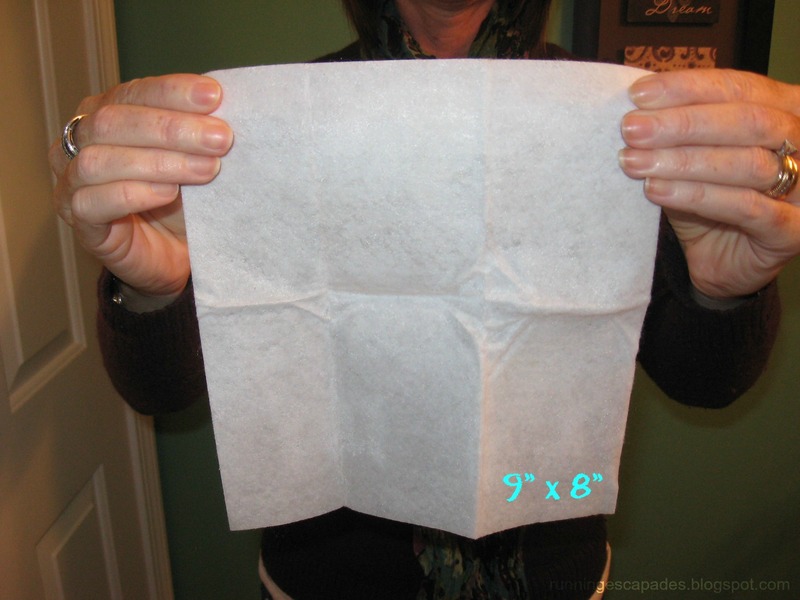 The body wipe is large (9"x8") and thick. The directions recommend keeping the "wipe folded" and using "each side on a different body part." I, on the other hand, immediately opened it all the way and used it more like a wash cloth. The cloth was cool and moist, and after wiping around my neck, I felt instantly clean and fresh. It's hard to describe how it smells, but it's basically fresh. Since it's a product for both men and women, I'm guessing the guys at ShowerPill picked a neutral scent. Personally, I would want to use it more if it did have a feminine fragrance. 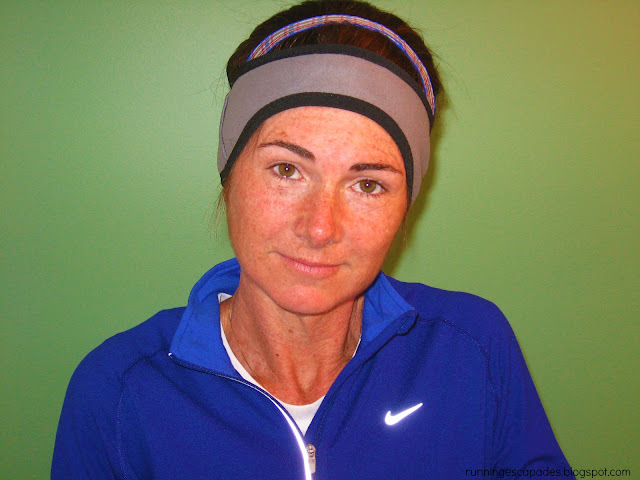 I already use a facial wipe and in the past I have just used a plain towel to wipe off the rest of my body after a run. Driving home or heading to one of the kids' sporting events with sweat still lingering on me is uncomfortable and gross. I can easily see myself using these in the future. ShowerPill has generously offered readers of Running Escapades a buy two (2), get one (1) FREE Black Friday Sale discount on Amazon.com. After placing three (3) boxes in your shopping cart, enter code SPFRIDAY to receive the 3rd box free. Offer is valid 11/23 - 11/25. Last week my running partner and I decided to mix things up. We threw in a hill route, an old route, and attempted a new route. It was an adventurous week. #TrainingTruths: Don't think of them as hills, think of them as "mounds of opportunity." I'd rather be standing at the top of the hill I just conquered than wondering what it would feel like. I'd rather struggle up it than walk away failing to even try. I'd rather enjoy the benefits of running them than miss out on becoming a better runner. 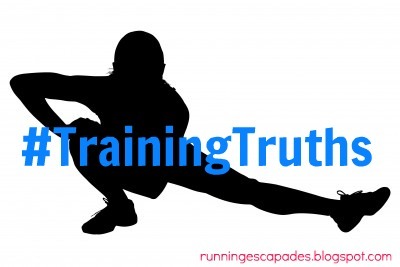 #TrainingTruths: Running familiar routes is comfortable. Sometimes I like to run a route that I have done many times because I know the area, I know the distance, and I know where everything is. Not only is it reassuring to be in a familiar area, but it's also fun to see the same faces and sights. #TrainingTruth: It's probably a good idea to have a map handy when running a new route. I love that runners share their routes on DailyMile so that I can find out about new places to run near me. Unfortunately, showing up without a map and a trail without markers caused us to take a wrong turn. 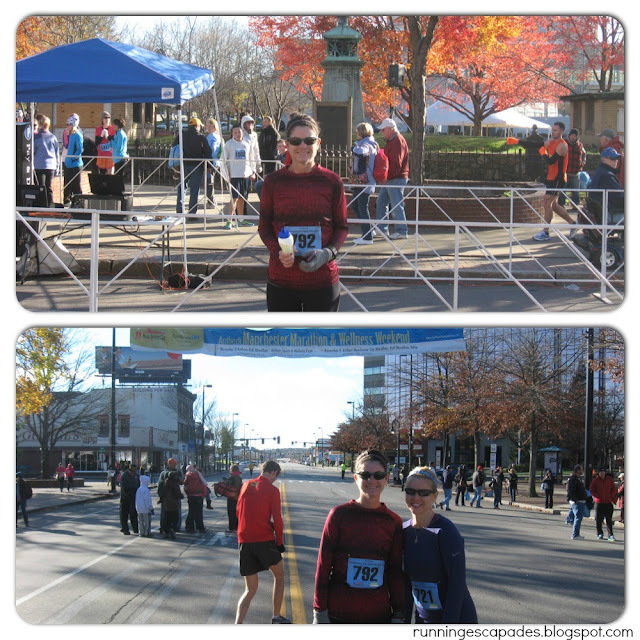 Our run turned out very different than what we had planned. 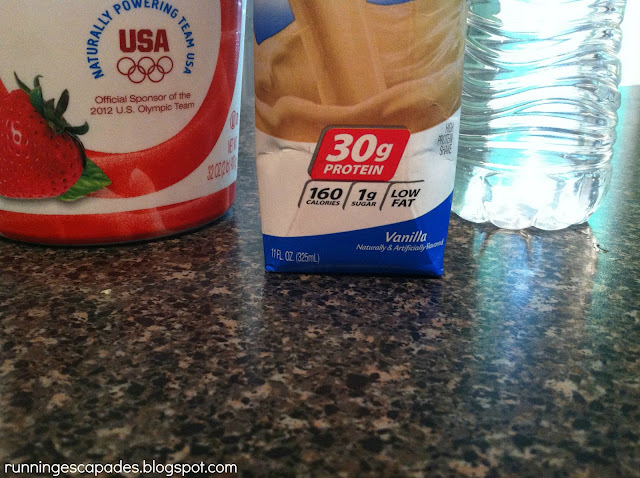 Anyone who engages in fitness has experienced the post workout soreness at some point. Pushing muscles beyond their normal threshold causes small muscle tears. Until our muscles adapt to the new type or level of workout, they will continue to need time to recover. 1. 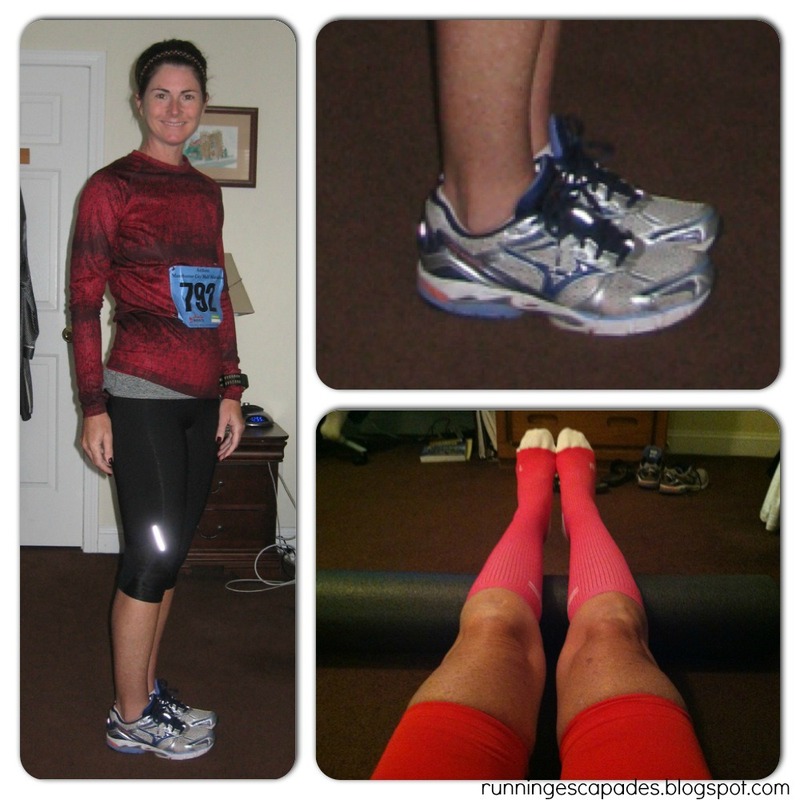 Compression gear - Invest in some good compression gear such as socks, sleeves, and shorts and put it on as soon as you finish an intense workout. The basic principle behind wearing compression gear is that it allows better blood flow to the muscles thereby helping to decrease muscle soreness. 2. 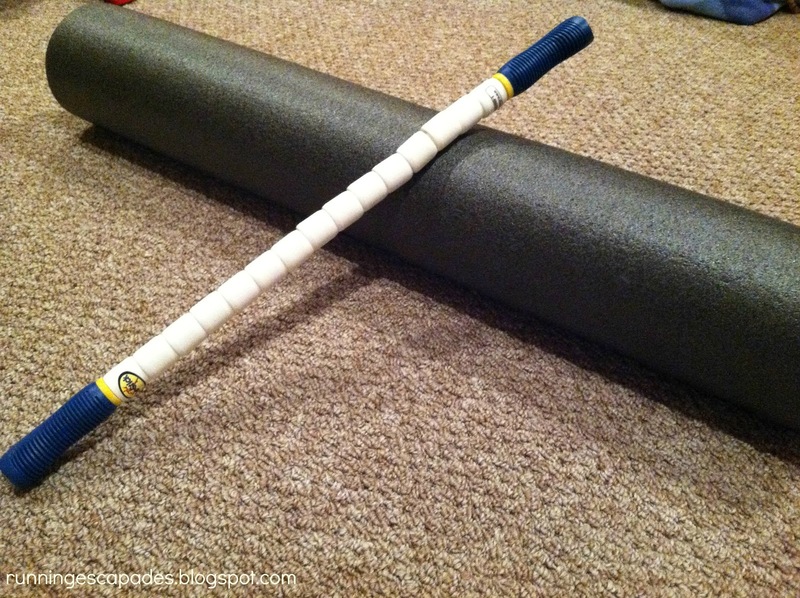 Foam Roll/Stretch - Avoid letting muscles stiffen up by stretching or foam rolling after exercise when the muscles are still warm. Again this will help increase the blood flow and help get rid of any lactic acid build up which could contribute to muscle soreness. 3. Rest - After strenuous exercise your body will need, and deserve, a break. Muscles need time to repair and rebuild. It's good to schedule some down time. Most training schedules include a rest day for this reason. 4. Active Recovery - While giving your body some rest is important, it is also a good idea to keep moving. 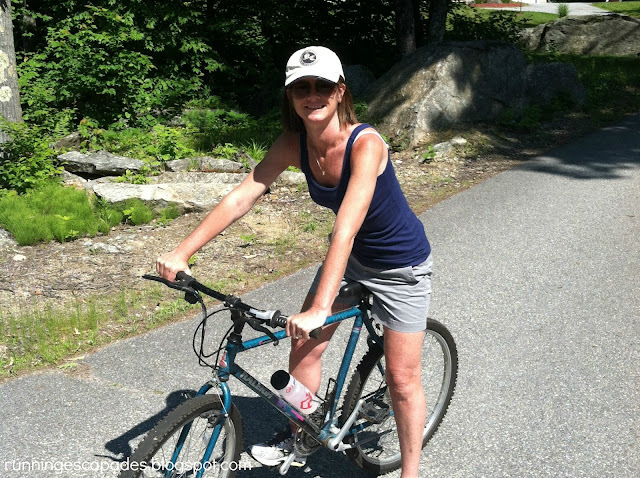 Take a walk, go for a casual bike ride, swim a little. Light activities that allow your muscles to move will help prevent tightness from setting in which can lead to increased muscle soreness. 5. Replenish - Drink plenty of water to rehydrate and eat protein and carbs to aid muscle recovery and replace nutrients lost during workouts. Not only will this replenish your body, but it will also help keep your muscles at peak performance for your next workout. What is your favorite recovery technique? You may remember that I participated in a Sprigs review a couple of weeks ago. This week, I'm happy to be reviewing another Sprigs product: Earbags. I like to run in the cold weather. I also like to be prepared and comfortable. When it comes to what I wear on my head, I'm pretty picky. 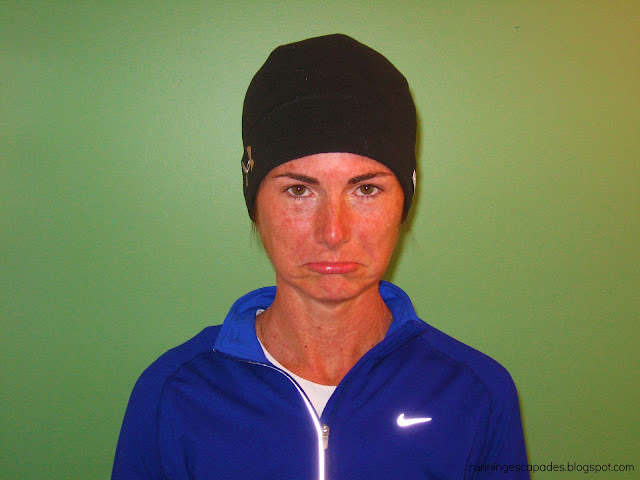 Many runners wear winter running hats to keep their head and ears warm. I too have tried these. While they do keep my ears warm, unfortunately they keep my head TOO warm. Since the hat was too warm, I tested a winter weather headband. This worked to keep my ears warm and let my head stay cool. However, I like to wear colorful, pretty hairbands to keep my locks under control. The combination of hairband and winter headband was just too much. Enter, Sprigs Earbags. 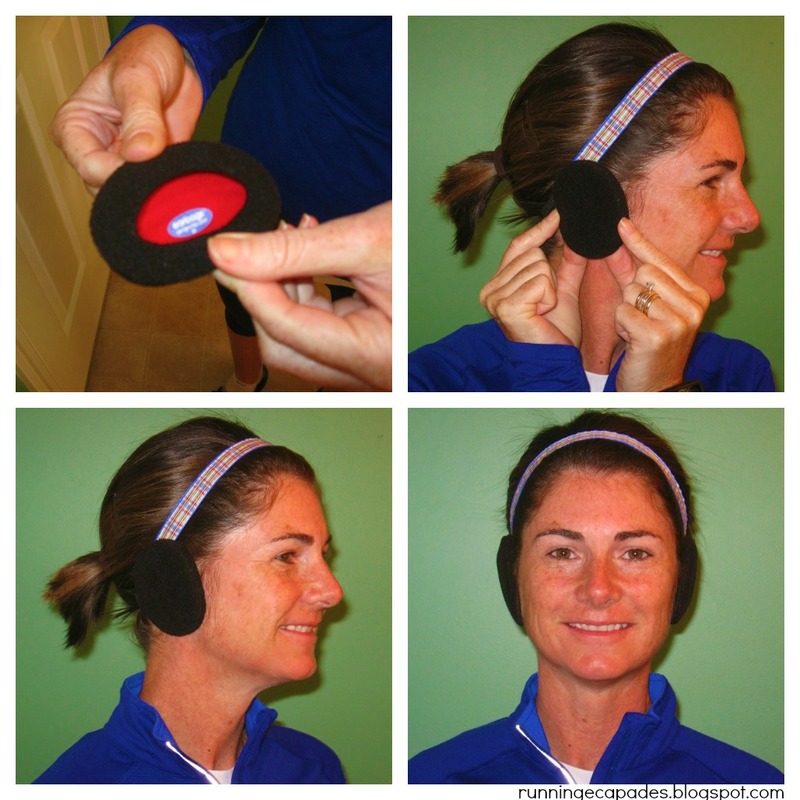 These bandless earmuffs keep my ears warm, let my head stay cool, and do not interfere with the wearing of my favorite hairbands. 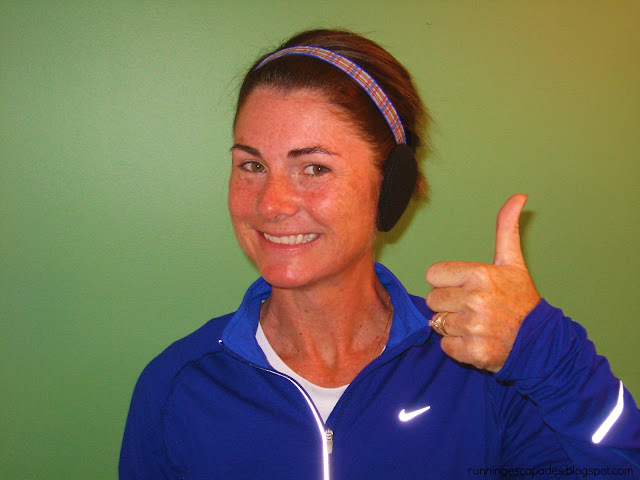 Earbags are little ear warmers that fit right over your ears. They come in a variety of sizes, colors, patterns, and materials. Lined with Thinsulate® they keep the cold outside and the warm inside. They also come with a super cute storage bag to keep them clean and safe. 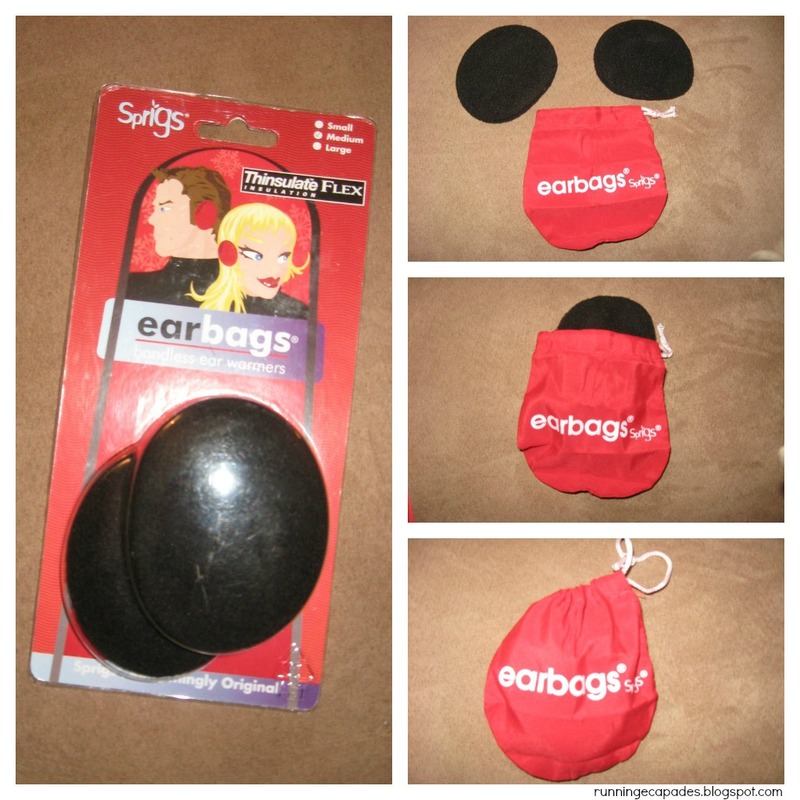 Earbags are extremely easy to use. First you flex it open by bending slightly back. Slide it over your ear and then snap in place by pushing forward. That's it! Sprigs has a great how-to video here. My trial with Earbags was performed on a 6 mile run in perfect weather conditions: temperatures hovering in the mid 30s, sunny skies, and a slight breeze. 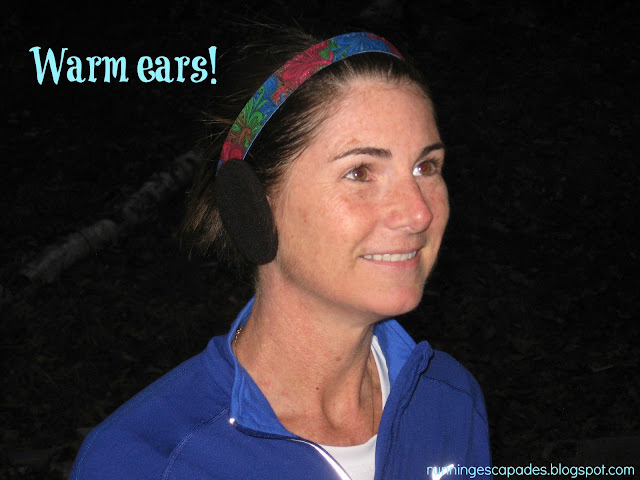 I easily slipped the bandless earmuffs over my ears standing right outside my car and then my running partner and I were off as usual. Occasionally during the run, I had to reach up to touch the Earbags to make sure they were still there. They were so light and didn't bounce or rub at all. Throughout the run I could hear my running partner's conversation without interference and my ears stayed comfortably warm. Sprigs has a great selection of Earbags and if you place an order during the month of November, you can use my coupon code Escapades20 for 10% off of orders up to $29.99 or 20% off orders over $30. It expires 12/12/12 at 11:59 PM EST. What kind of winter head gear do you prefer? I was not compensated for this post, however I did receive the Earbags at no cost. All opinions are my own. Thank you to everyone who entered. If you didn't win, STAY TUNED. I have another giveaway coming up! Last week was all about recovery. Time to take a little break, let my legs recuperate, and figure out what's causing the pain in my a$$! #TrainingTruths: Active Release Therapy hurts so good. Trainer Brian diagnosed me with a super tight semitendinosus and gave me specific hamstring and hip stretches to do AFTER running plus 30 minutes of ART which I get to repeat twice a week. #TrainingTruths: Rest days are more important than we realize. After the challenging half marathon on Sunday, I acknowledged that I have been running a lot (maybe Trainer Brian helped with this). Since school was closed on Tuesday for the election, I took advantage of having the day off and kept the running shoes off as well. #TrainingTruths: Treadmill runs are not as bad when you have a workout plan. 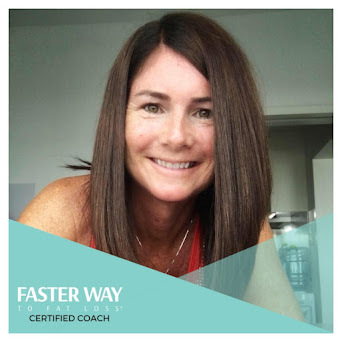 Cold and rainy weather didn't sound fun, so I jumped on the 'mill and followed a Sing-along Run workout recommended by Dimity in the Another Mother Runner November newsletter. This workout allowed me to keep things nice and easy; a great workout for recovery week. 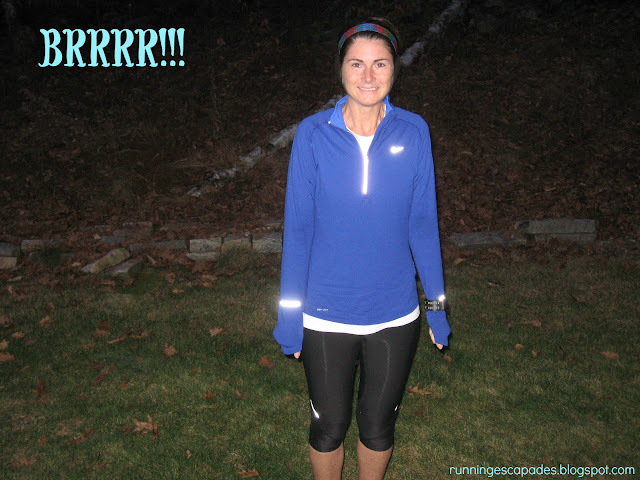 #TrainingTruths: It is so much easier to run in the cold weather. I like to run with temperatures in the 30s. Just recently I learned that the colder the weather, the less heat stress on the body. Since my body isn't working as hard, the running feels easier. It's early morning and somewhere a runner is lacing up her shoes, attaching her reflective vest and head lamps, and stepping out into the darkness. Elsewhere a runner is looking very determined as he makes his way up the steep hill that even causes a car's engine to groan. 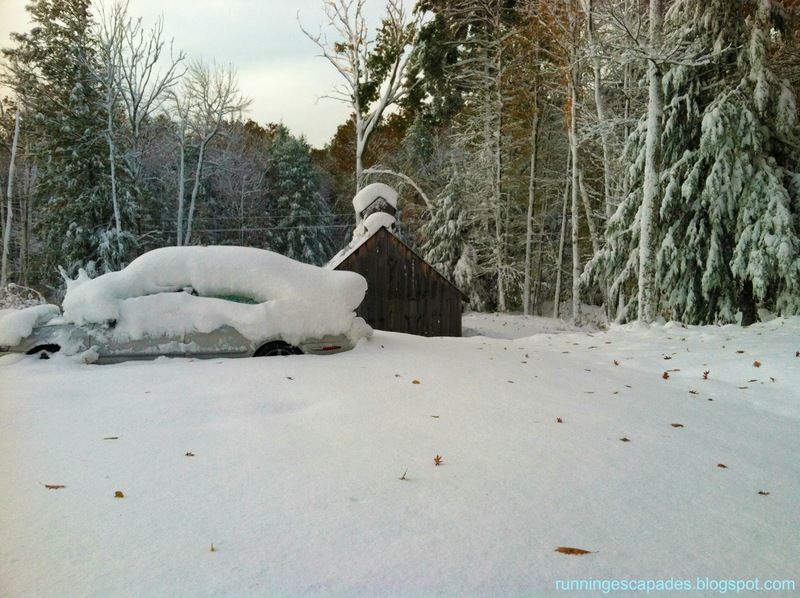 A snow storm arrives just as another runner in her thermal tights is pulling on her winter cap and gloves before hitting the snow covered trail. A lot of people see these runners and wonder, why? Why do you want to get up so early when you can be sleeping in? 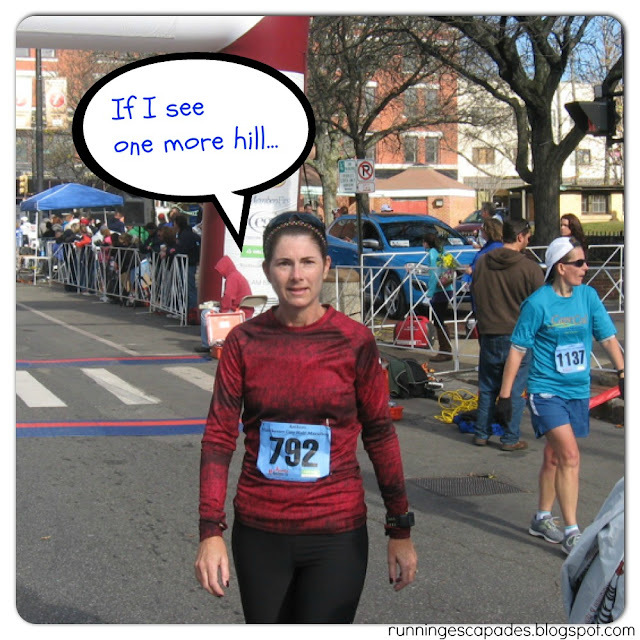 Why do you want to run up the nasty hill that causes you pain? Why do you want to go out in the middle of a winter storm and freeze? The truth is, I run because of the way it makes me feel. I want to be healthy and fit. 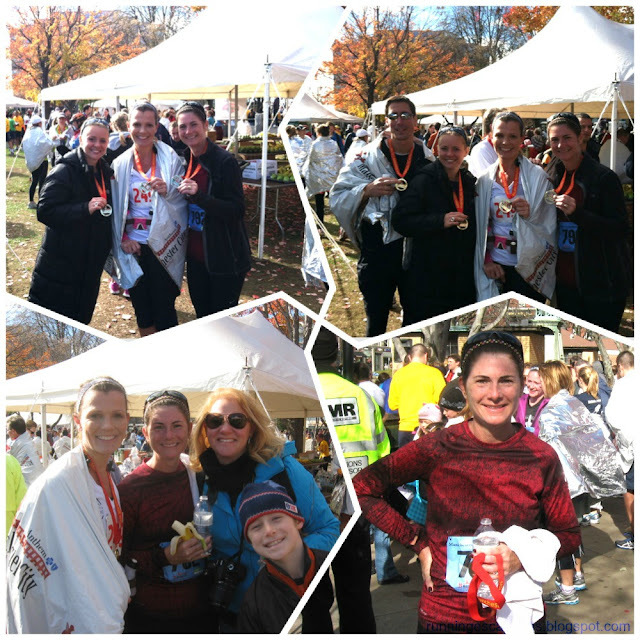 I like running with my family and friends. I've had amazing experiences, met great people, and run races in some incredibly beautiful places. Yet, it is something bigger that keeps me lacing up my shoes and logging the miles. I run because it makes me happy. When I look at my running pictures, I can see it in my face. A perma-grin is usually plastered there. When the topic of running comes up in conversation, I can hear the excitement and energy in my voice. Even during a tough run, when it's not reflected in my face, little bubbles of bliss are lingering just under the surface. Really, they are. Today is the last day to enter my Big Banjees Wrist Wallet GIVEAWAY! On Sunday I ran the Manchester City Half Marathon. According to the local news, this year's race started with a record 2500 runners including some 600 displaced NYC Marathon runners! 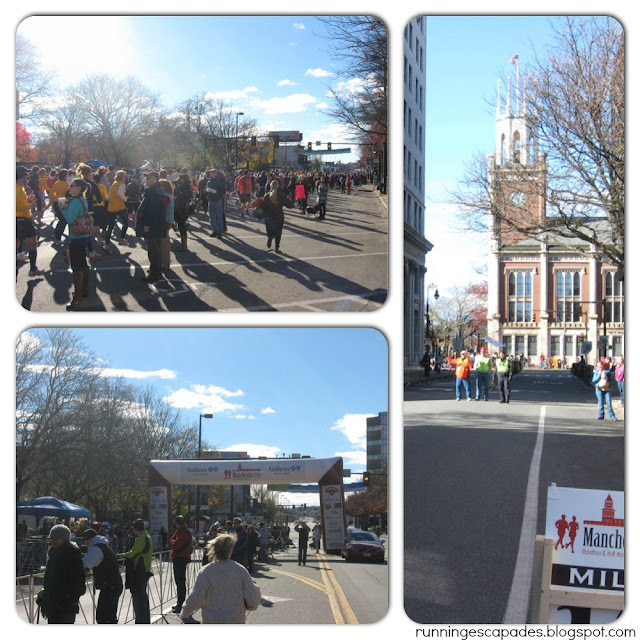 It was a beautiful day for a race with temperatures in the low 40s, bright sunny skies, and cool breezes. After getting an extra hour of sleep, my favorite cheerleader (aka husband) drove me downtown to meet up with the girls. I found Daisy easily (thanks to her "prime parking spot" in a no parking area next to Veteran's Park, but Katherine was off getting a replacement bib for the one she left at home. We did manage to all meet up at the starting line. You may remember from my previous blog posts or my comments on Daily Mile how this course had some serious hills. The first hill starts around mile 1 and continues until mile 2.5. There's a brief breather before the next climb at mile 3.5 which lasts through mile 5. Here runners are rewarded with a long downhill into Livingston Park before hitting the next group of climbs. At mile 6 the rolling begins (and seems to never end) and goes on and on through mile 10. Just when you think you might be able to cruise to the finish thanks to gravity and Hanover Street, runners hit a final tough climb between mile 11 and 12. For those runners with feeling left in their legs (not me) the final mile is a fast downhill that flattens out to the finish line. Clearly, I was dead tired. I didn't hear them announce me as Amy from Jamaica Plain and then correct it. I barely cracked a smile when Katherine and Ami cheered for me as I passed by. I didn't even have the energy to grab one of those awesome mylar heat sheets they were offering. I did have enough spark to hang out with the girls and our families while savoring the moment. I took on a challenge running this half marathon with its monster hills that scare some runners away and I completed it. #7 done. What's the toughest race you've ever done? Have you entered my Sprigs Big Banjees giveaway yet? It ends Friday at 11:59 PM! Or start shopping now and use my discount code RunningEscapades20 for 10% off of orders up to $29.99 or 20% off orders over $30. It expires 11/30/12 at 11:59 PM EST.